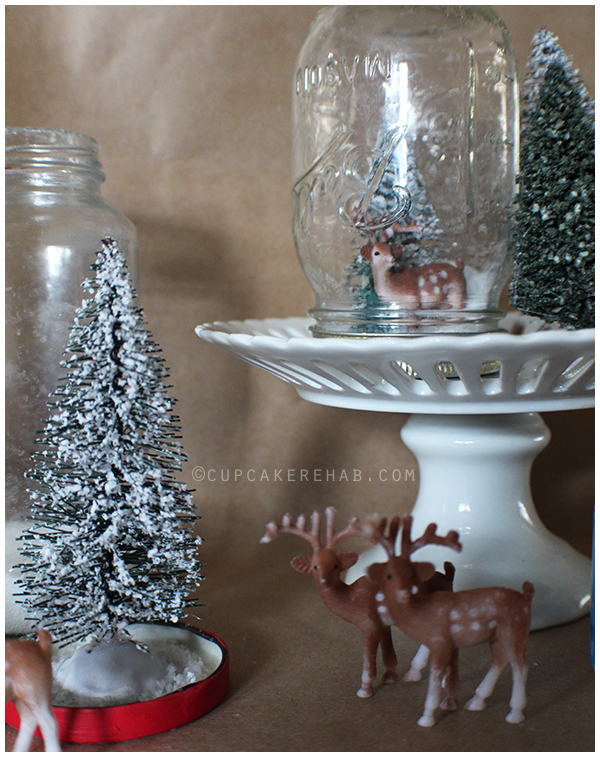 DIY magic: mason jar snow globes. Oh, December. How I love you. Make no mistake- Halloween is my absolute favorite holiday. Hands down. However, it’s only acceptable for me to play White Christmas over & over again in December. I don’t mind watching it in February or July, but I find other people take issue. Or perhaps they just take issue with me singing all of the songs (particularly this one & this one) out loud at the top of my lungs? Anyway. I wait until at least after turkey day to break out the Bing! Also, December is the Mount Everest of baking/creating: the best crafts, recipes, and decorations are happening right around now! This tutorial is something you’ve probably seen all over the internet. No, not probably. Definitely. I’ve seen this concept more times in the past two weeks than I’ve seen my fiancee, it seems. I’m just repeating it here to show you how stupidly easy it is. And how fun it is. And chances are, you’ve already got the materials- or most of them- laying around the house. It’s a knockoff of a product that Anthropologie made (they made salt shaker ones too), hence the lack of water. I chose to use a pint jar & an 8-oz. jar, both regular mouth (& both Ball® brand) as well as one fairly large spaghetti sauce jar. You can use ANY freakin’ jar you want- just like with those Halloween jars I made. Recycle your old spaghetti sauce jars, pickle jars or baby food jars. Whatever you’ve got, it works! Basically, you need jars/salt shakers/globes, glitter or fake snow, and trees/snowmen/deer/santa figures. If you’d like to use water, get ones that are made of plastic or something that won’t rust or dissolve in water. That’s it. Anything else you want to add is purely extra. Yes, like the link above, you CAN use little glass salt & pepper shakers too. You need very small objects to go inside, but it’s a definitely possibility. I’d also cover the holes with plastic (on the inside) so the glitter doesn’t shake out. Pretty much any glass container with a lid can be used for this. And yes, you can use water. If you want to do it that way, I suggest you put a few drops of glycerin in the water along with the glitter/snow. It basically makes the water more viscous, allowing the “snow” to fall instead of just sink. I also recommend gluing the lid of the jar on so no water seeps out (especially if there are little hands doing a lot of shaking!). 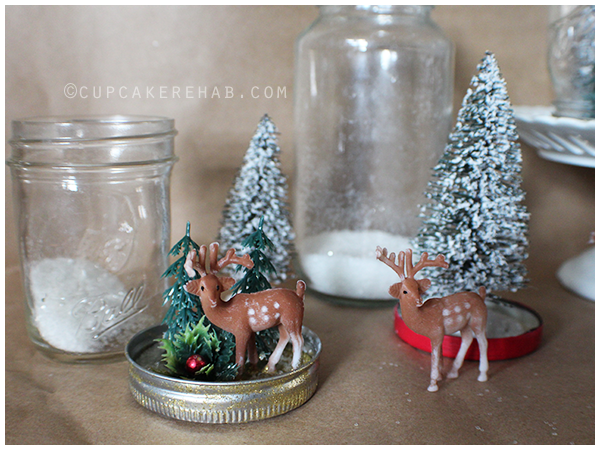 My scene items are a mix of winter village trees & cupcake toppers- surprise, surprise. I snipped the bottoms off the cupcake topper trees & the little mistletoe bunches so they’d glue on easier. You can find similar tree toppers & deer toppers at the Layer Cake Shop. The taller snow-covered trees like what I used aren’t waterproof, so don’t use them if you’re using water. I opted for white “crystal ice” glitter instead of an opalescent white. I thought it looked more like snow. But you can use ANY color glitter you want! Use white, silver, gold, the white opalescent, etc. You can use large glitter or small glitter, you can toss in some snowflake-shaped sequins too if you want. But you can also always use the faux snow they sell to use in Department 56 villages as well. And if you wanna be SUPER DIY… make your own bottle brush trees to put inside! 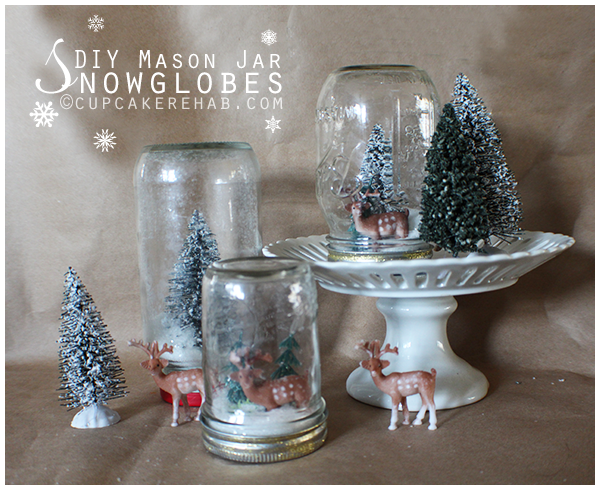 First, if you’re using jars with two-piece lids, glue them together & let them dry. Sand the inside of the lid gently & glue the figures on, careful to avoid putting anything too close to the edges (you want the jars to close easily). Let dry. If you’re painting your lids, do it now. Give it a coat, let it dry, repeat. Add glitter! You only need enough to cover the bottom of the jar as if it’s a sheet of snow- so don’t go crazy! 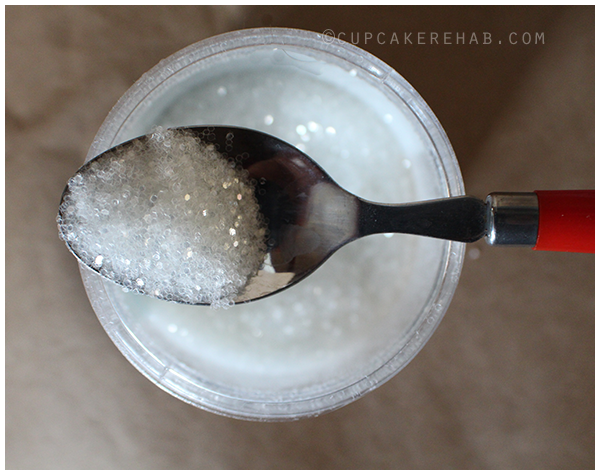 Dry the rim of the jar and add some glue to the inside of the rim of the lid. Screw it on gently, wipe off excess glue if any, and let dry. Turn right side up and enjoy your new snow globe! I painted one lid red because the brand name was very visible. I gave the rest a thin coat of some gold glitter paint. I wasn’t too pleased with the way that turned out. I’m sorry I didn’t use regular green or gold paint! Oh well. It kinda gives it a vintage-y look. These make great gifts. And they don’t have to just be for Christmas. I’m thinking a little ballerina cupcake topper with a pink painted lid & pink/silver glitter would be a great gift for a little girl. Maybe a dinosaur for a little boy? The taller the jar, the larger your figure should be. Think about the scale before you create your scene. 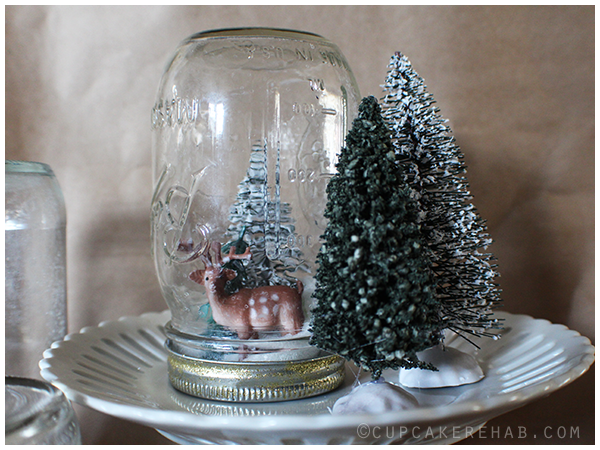 Larger plastic or metal trees meant for those winter villages or model trains are perfect for bigger jars (sauce jars, pickle jars). So are bottle brush trees! Smaller figures work great in baby food jars or jam jars. And like I said- cupcake toppers work amazingly well in small/medium size jars! 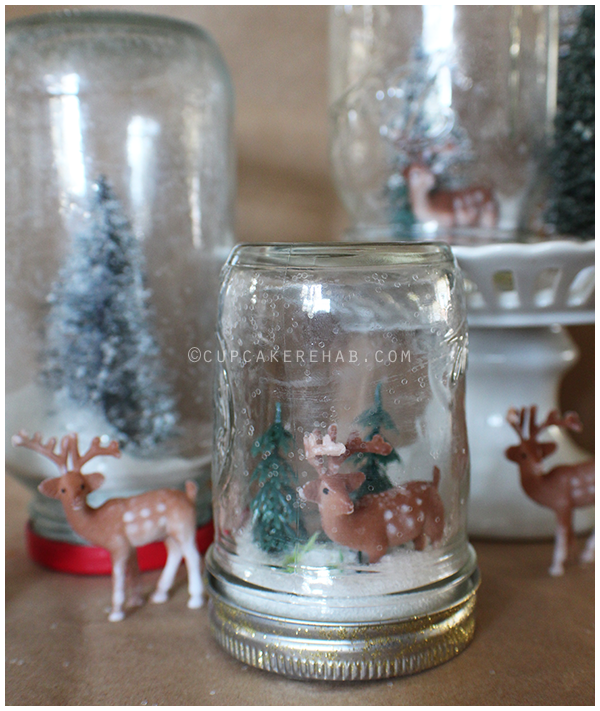 You can also use vintage jars with the bail lid if you have a lot. 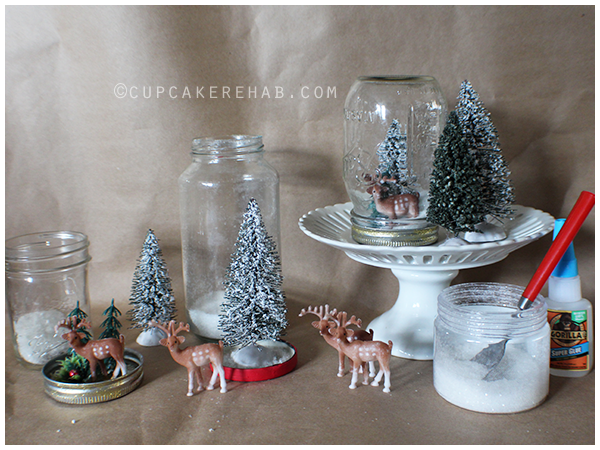 Don’t glue anything in, just place the objects & the snow at the bottom & close it. That way you can clean it out after the holidays! Again, I stress… make sure your objects are waterproof if you want to use water. Nothing would be sadder or more ironic than a rusting tree or dissolving snowman glued in a mason jar for all eternity. And please, do not use Epsom salts if you’re using water. I know it seems like common sense, but folks nowadays are severely lacking in that department. I love the idea of a few of these on a bookshelf with some Christmas books. Or maybe on a kitchen shelf, mixed in with vintage jars & cake plates? For a larger, more intricate version of the “snow jar”, click here. Previous Post Sprinkles! A “rainbowlicious” book review & giveaway! Next Post Dark-chocolate-peanut-butter-filled-white-chocolate candies from heaven. I am totally making these as placecard holders, too! I love it! This is a super cute idea. And placeholders are a GREAT IDEA! OMG so cute! And of course I love the specimen jars. OMG I LOVE! Awesome idea!! Wonderful, what a webpage it is! This blog gives helpful facts to us, keep it up. Hello, everything is going fine here and ofcourse every one is sharing information, that’s in fact excellent, keep up writing. This post is really a fastidious one it helps new internet people, who are wishing in favor of blogging. Glance advanced to more brought agreeable from you! However, how could we be in contact?